Powell was born on April 5, 1937, in the New York City neighborhood of Harlem. The son of two Jamaican immigrants, he was raised in the South Bronx. He attended City College of New York, and it was there that he began his military service, joining the Reserve Officer Training Corps (ROTC). After his graduation in 1958, Powell was commissioned a second lieutenant in the U.S. Army. During his 35 years in the Army, he served two tours in Vietnam, was stationed in West Germany and South Korea, and acted as President Ronald Reagan's Deputy National Security Advisor in 1987 then National Security Advisor from 1988 until 1989. In 1989 he was promoted to the rank of general, and was appointed by President George H.W. Bush to the position of Chairman of the Joint Chiefs of Staff. In the four years Powell served in that capacity, he oversaw 28 crises, including Operation Desert Storm in 1991. After his retirement in 1993, he founded America's Promise, an organization which helps at-risk children. He was nominated for Secretary of State by President George W. Bush on December 16, 2000. 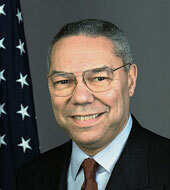 Powell's term, however, was soon dominated by the challenges the Bush Administration faced after the September 11, 2001, terrorist attacks. Powell was one of the foremost supporters of taking swift military action against al-Qaeda and demanded immediate cooperation from Afghanistan and Pakistan in the U.S. search for those who were complicit in the attacks. When the Administration's attention shifted to Iraq and the possibility that Saddam Hussein was manufacturing weapons of mass destruction (WMD), Powell pressed to have UN inspectors investigate. In February 2003, Powell presented intelligence to the UN that supported the claim that Iraq had weapons of mass destruction and could produce more. Subsequently, the Administration moved quickly toward preemptive military action against Iraq, despite Powell’s advice that war should not begin until a large coalition of allies and a long-term occupation plan were in place. In 2004, some of the intelligence that Powell had brought before the UN in 2003 was found to be erroneous. On November 15, 2004, Powell announced his resignation. After stepping down as Secretary of State, he returned to a busy life in the private sector continuing his work with America's Promise Alliance. He serves on the Boards of Directors of the Council on Foreign Relations, the Eisenhower Fellowship Program, and the Powell Center at the City College of New York.